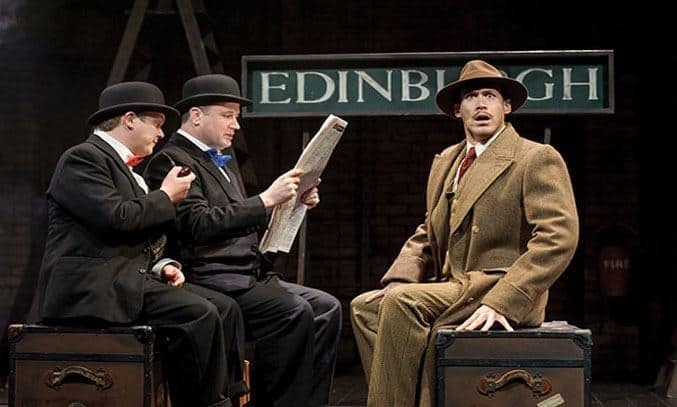 Considering THE 39 STEPS is now in its 10th year, the award-winning production is still in spiffing form. After nine years in London’s West End, Patrick Barlow’s hilarious adaptation is back on tour and is as bonkers and as brilliant as ever. Inspired by Alfred Hitchcock’s The 39 Steps [DVD][1939 version starring Robert Donat] , THE 39 STEPS tells the incredible adventures of returning colonial Richard Hannay who gets embroiled in a spy hunt which takes him from London to Scotland. The wonderfully inventive comedy thriller sees four fearless actors play an impressive 139 roles in 100 minutes in a full-on comedy caper-farce that will have you belly laughing right from the start. The show’s success lies in the speed and synchronization of its tiny cast and crew. Fast-paced, well-polished and sublimely executed, every inch of this production is played for laughs from the lightning quick costume changes and cracking physical storytelling, to the clever use of props and pun-slinging script which pokes fun at the dialogue of the period. Much of the delight results from the inspired imaginations of a backstage crew. Peter McKintosh’s minimal brick-lined set acts as a blank canvas for the rapidly changing scenes and there are plenty of clever visual moments including a train-top chase and a shadow puppet sequence which is used to great effect. Richard Ede makes a fine Richard Hannay, the stiff upper lipped hero desperate to discover the secret of the eponymous 39 steps before the information leaves the country. 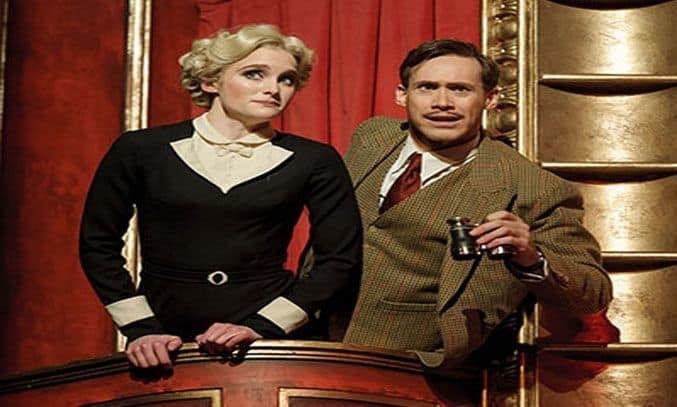 With his David Niven moustache, natty tweeds and a jolly British tone, Ede holds the whole production together with a fine sense of style, making the audience a willing accomplice by breaking down the fourth wall early on. Olivia Greene is tasked with playing the bulk of the female roles from the femme fatale Annabelle Schmidt to the frightfully posh and suitably brittle Pamela who accompanies Hannay on the last leg of his journey. But the pair are uproariously upstaged by Andrew Hodges and Rob Witcomb who prove a glorious double act, playing a multitude of characters from policemen to older ladies. Their flare for physical comedy shines through in the train sequence in which they play multiple characters at once, frantically switching between different hats with impeccable comic timing. A special mention also must go to Witcomb for his performance as Mr. Memory, particularly in the final scene where his frantic monologue leaves both him and the audience breathless. The only criticism relates to a couple of sounds issues in the first half which makes it difficult to hear some of the dialogue. Greene’s harsh German accent as Annabelle Schmidt is also incredibly sharp, making it challenging to understand at times. Aside from this, the production is difficult to fault with the cast taking every opportunity to squeeze the comedy out of every moment without ever appearing desperate for a cheap laugh. With its run in London’s West End now at an end, I fear that this may be one of the last opportunities for audiences to see THE 39 STEPS so I urge you to buy a ticket for this fast-paced, fun and thrilling adaptation before it’s too late. You won’t regret it!